Q: I have various home MPEG videos that I want to save onto a DVD and watch it on my DVD player. Is there a way (preferable free) to burn MPEG to DVD that anyone can recommend? I need it to be easy enough to use? A: MPEG, or MPG, is a widely used video format in most computer systems. Do you have some MPEG files stored on your computer and want to burn MPEG to DVD so that you can watch them on your DVD player? Now you can just follow this article to convert MPEG to DVD for storage and at the same time make your MPEG videos portable. Here the professional DVD Creator for Mac from Aimersoft is recommended to help you create a DVD from MPEG files for playback on any DVD player or TV. Thanks to the friendly interface of this MPEG to DVD burner, the burning process can be done in just a few clicks. No matter your MPEG/MPG videos are downloaded from the Internet or taken by your camcorders, you can burn them to DVD with no hassles. Apart from MPEG, this program can also burn DVD from other video formats like MP4, AVI, WMV, MOV, FLV and an array of others. The Mac DVD burner is compatible with Mac OS X 10.6, 10.7, 10.8 Mountain Lion, 10.9 Mavericks, 10.10 Yosemite and 10.11 El Capitan while the Windows version supports Windows 10/8/7/XP/Vista. Now get the burner and make a DVD from your MPEG videos following the tips below. Here we take converting MPEG files to DVD on Mac OS X as an example to show you how to easily accomplish your task. The way to complete the burning process in Windows is the same. Now you just need to make sure you've installed the right version. Run the program and click "+" to choose and add the MPEG video files you want to burn and click OK to load them. Or directly drag and drop MPEG movies into the program window. All the added videos can be previewed and you're free to adjust the video order by clicking the arrows. When adding files, please pay attention to the bar at the bottom that shows how much space is left on a DVD5 or DVD9. Just make sure the video size doesn't exceed the DVD capacity. This MPEG burner comes with a video editor that allows you to touch up your videos in clicks. 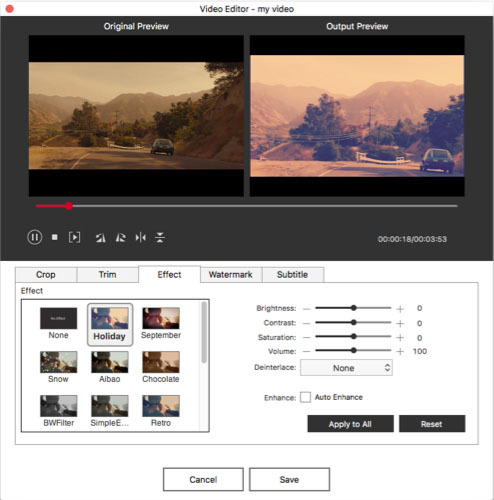 To edit a video, highlight the video and click Edit to open the Video Edit window, where you can crop videos, trim videos, rotate videos, add watermarks, apply special video effects, etc. It's almost done there. Now insert a blank DVD into your computer's DVD writer, click the Burn button on the main interface and choose DVD as the output option to start burning a DVD from the added MPEG videos. Once the burning completes, you can watch the DVD on home DVD players or portable DVD players with ease. Here is the video tutorial on converting MPEG movies to DVD on Mac OS X.
MPEG, also called MPG, is a compression file format developed by MPEG, Moving Picture Experts Group, which was formed by the ISO to set standards for audio and video compression and transmission. Its first meeting was in May 1988 in Ottawa, Canada. MPEG's official designation is ISO/IEC JTC1/SC29 WG11. MPEG-1 videos are often found on VideoCD (VCD) discs and MPEG-2 videos are used on DVD discs and Super VideoCD (SVCD). The file extensions of MPEG-1/MPEG-2 videos are .mpg or .mpeg. Burn Streaming Video to DVD: Have the need to burn streaming videos to DVD? You can easily accomplish the task by following the tutorial. Convert SD Card to DVD: Looking for a way to transfer videos in SD card to DVD? This article will show you the simple steps. Is there any chance to get rid of the watermark? Thanks for the free download! I just downloaded and used this for the first time this week and I am happy with the way it works. It is reasonably easy to learn how to use it. Your directions here helped a lot, thanks! While I don't do a lot of burning/ripping of CD's or DVD's, (I let my husband do that! ), I like the video editing abilities this has! I am always in the need of good video editing software. Hi, it has many other functions as well, just like creating customized photo DVD slideshow, editing videos and create Custom DVD Menus. Besides converting videos to DVD, what else can it do? Actually I was worried about the quality of the output DVD. But the result is quite nice. Thank you! I used to store a lot of MPEG files in my computer and they occupied a lot of space. Now with this product, I can solve this problem from now on. Great!